In 1973 Gary Gygax and Dave Arneson of TSR turned the gaming world completely on its ear and ushered in an entire new category of games: role-playing games (or RPGs). Dungeons and Dragons, unlike traditional board games, technically didn't even need a board. Most D&D games used some form of map, but the adventure largely took place in the imaginations of those playing. One gamer serves as the Dungeon Master, the all-seeing eye that narrated the adventure, held all the secret maps, and controlled all the non-player characters. The rest of the players create characters of their own to undertake a life of adventure and excitement. During game play, the Dungeon Master presents a world of dragons, elves, dwarves, orcs and many more patrons of the fantasy realm to the players. By assuming the identity of the characters they create, the players face these challenges and sole puzzles, fight monsters and villains, and conquer dungeons. 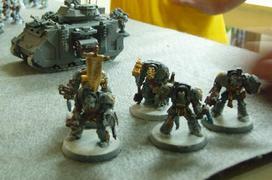 Throughout the gaming sessions, the players continue to play the same characters, and the the characters become more powerful over time. One of the greatest pleasures for the play is developing the character as they grow in power, often building a notebook of character notes and statistics.The game is completely open-ended. There is only a beginning; there is no end. As long as the dungeon master has more stories to tell, and the players want to listen and play, the game goes on. Players get the pleasure of beginning a campaign assuming the role of a young squire or novice apprentice and developing him or her into a gallant knight or mighty wizard. The RPG fury simmered down a bit by the mid-80's, as many early D&D players reached the age where reality took more and more time out of fantasy's schedule. 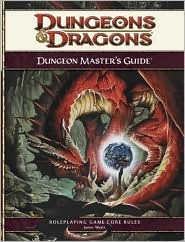 The game thrived with its core audience of die-hard fantasy buffs, however, and new Dungeons & Dragons editions continue to be released into the new millennium. TSR eventually sold out to Magic: The Gathering makers Wizards of the Coast, who in turn sold to Hasbro, but the D&D brand name still draws in wizarding wannabes today. Through video games like Baldur's Gate, a December 2000 Dungeons & Dragons feature film, and the ongoing original game, Dungeons & Dragons' eternal quest for danger, battle, treasure and fantasy continue to offer at least a brief respite from this everyday and ordinary world of ours. Dungeons and Dragons is a social game that encourages cooperation, problem solving, math skills, and creativity. One of the most interesting characteristics of the game is that every gaming group has a different style and nature to play, with some groups focusing more on role-playing and problem solving, while others focus on combat and slaying monsters. Negative press and controversy in the 80's was brought forth from religious and parental groups, claiming the game was devil worship and lead to violent behavior, but they have been rebutted successfully on every court. Many parents see Dungeons and Dragons as a positive influence of their child's life, giving them social skills and helping them to develop a moral code. 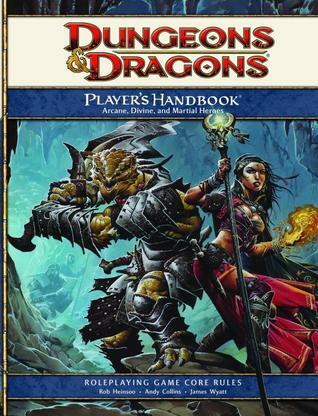 The gaming materials for Dungeons and Dragons center largely around hard-cover rule books. 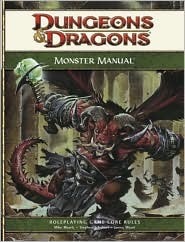 The Player's Handbook, Monster Manual, and the Dungeon's Master Guides are almost essential, but there are many more rule books to flesh out rules, character development, and adventuring ideas. Multi-sided dice are used to generate a random element, and plastic or metal miniature greatly enhance play by allowing players and the dungeon master to represent the actions in battle. 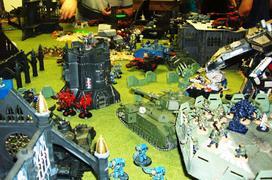 However the major component to play Dungeons and Dragons is one's imagination. Dungeons and Dragons Miniature, a game also by Wizard's of the Coast, use the same combat system, and the figures are appropriate for the role-playing version of Dungeons and Dragons as well. Origin Based loosely off of the references developed by Lord of the Rings, Mythology, and history. Other Products PC and X-Box Games, Novels, movies.